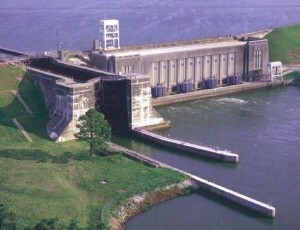 The Pinopolis Lock at Santee Cooper’s Jefferies Hydroelectric Station was the highest single-lift lock in the world at the time of its construction. In it, boats up to 150 feet can be raised or lowered the 75 feet difference between the Tailrace Canal and Lake Moultrie. The lock is open from 1/2 hour after dawn until 1/2 hour before dusk year-round. No lock operations are performed during thunderstorms or when rough water exists.